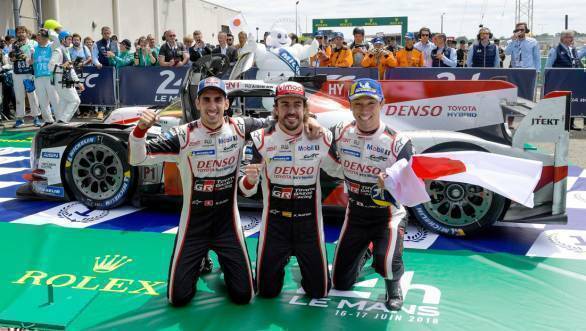 Toyota has finally won Le Mans! The No.8 Toyota TS050 Hybrid, with Kazuki Nakajima behind the wheel, crossed the chequered flag first. The car that Nakajima shared with Sebastien Buemi and F1 driver Fernando Alonso led a 1-2 finish for the Japanese manufacturer. 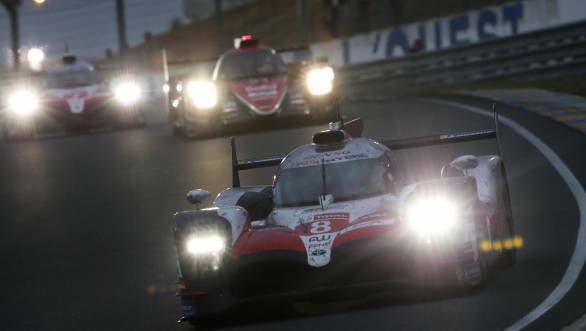 Finishing second at Le Mans was the No.7 Toyota that was piloted by Mike Conway, Kamui Kobayashi and Jose Maria Lopez. The result has helped Toyota, to a certain extent, put behind them the last lap incident of 2016, that saw an almost sure victory for them snatched away at the very last minute. Back then, it was Nakajima and Buemi who lost the race, and winning it this time around, must be something special. It was the 20th Le Mans for Toyota, who finally managed to conquer the Circuit de la Sarthe, although it was a win without real opposition. The non-hybrid LMP1 privateers finished 12 laps behind. 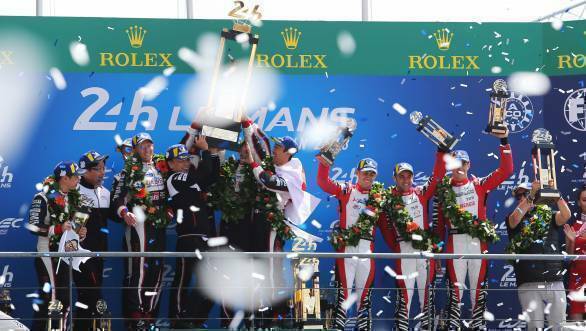 Third place at Le Mans went to No.3 Rebellion, with Thomas Laurent, Gustavo Menezes, and Mathias Beche. Toyota had something of a battle within their own team, with the No.7 car looking strong when the No.8 car had a stop-go penalty for driving too fast in a slow-zone. But Fernando Alonso did a strong stint, cutting the gap down to 30 seconds in the wee hours of the night. Alonso then handed the car over to Nakajima, who took the lead in the race as dawn broke. Buemi then put in a solid stint, followed by a strong stint from Alonso too. Disaster struck for the No.7 Toyota though, when a miscommunication led to the car slowing down, and dropping a lap down. Then, the same crew were slapped with penalties for exceeding the number of allowed laps in a stint, and amount of fuel being exceeded too. This meant that there was some breathing room for Nakajima and crew, who were able to make it to the chequered flag first. It was a disappointing Le Mans for Jenson Button and SMP Racing whose race ended with an engine blow up. Victory in the LMP2 class went to G-Drive Racing's Jean-Eric Vergne, with team-mates Roman Rusinov and Andrea Pizzitola. Victory in the GTE Pro class went to Porsche, whose No.92 911 RSR with Michael Christensen, Kevin Estre and Laurens Vanthoor behind the wheel. Second place went to the other Porsche of Fred Makowiecki, Richard Lietz and Gianmaria Bruni. It was a good way for Porsche to celebrate their 70th anniversary. Porsche went on to win in the GTE-Am class too. The Dempsey-Proton Racing customer team's #77 911 RSR with Matt Campbell, Christian Ried and Julien Andlauer behind the wheel took victory.